Chatrium Hotels & Residences is pleased to announce that our 6 properties; 1. Chatrium Hotel Riverside Bangkok, 2. Chatrium Residence Sathon Bangkok, 3. Emporium Suites by Chatrium, 4. Maitria Hotel Sukhumvit 18 – A Chatrium Collection, 5. Chatrium Golf Resort Soi Dao Chanthaburi, 6. Chatrium Hotel Royal Lake Yangon have been awarded the Certificate of Excellence 2018 by TripAdvisor, one of the world’s largest travel websites. The six award-winning Chatrium properties offer something for everyone. Chatrium Hotel Riverside Bangkok has captivating riverside charm, astounding views, and easy access to the Chao Phraya River and Bangkok’s mass transit systems. Find a contemporary city oasis of gardens and delight at Chatrium Residence Sathon Bangkok in the midst of the Sathon business and shopping district. In the city’s dynamic Sukhumvit shopping district, guests can embrace iconic living in luxury at Emporium Suites by Chatrium, or stay savvy at Maitria Hotel Sukhumvit 18 – A Chatrium Collection. Beyond Bangkok, the international travel hub of Southeast Asia, find extraordinary lakeside comfort at Chatrium Hotel Royal Lake Yangon in Myanmar, with its fantastic views of the Shwedagon Pagoda, or a breathtaking highland sanctuary in southeastern Thailand at Chatrium Golf Resort Soi Dao Chanthaburi. The Certificate of Excellence honours hospitality businesses that deliver consistently great service across the world. TripAdvisor says this designation is presented to approximately 10% of total businesses on its website that have consistently achieved great reviews over the past year. 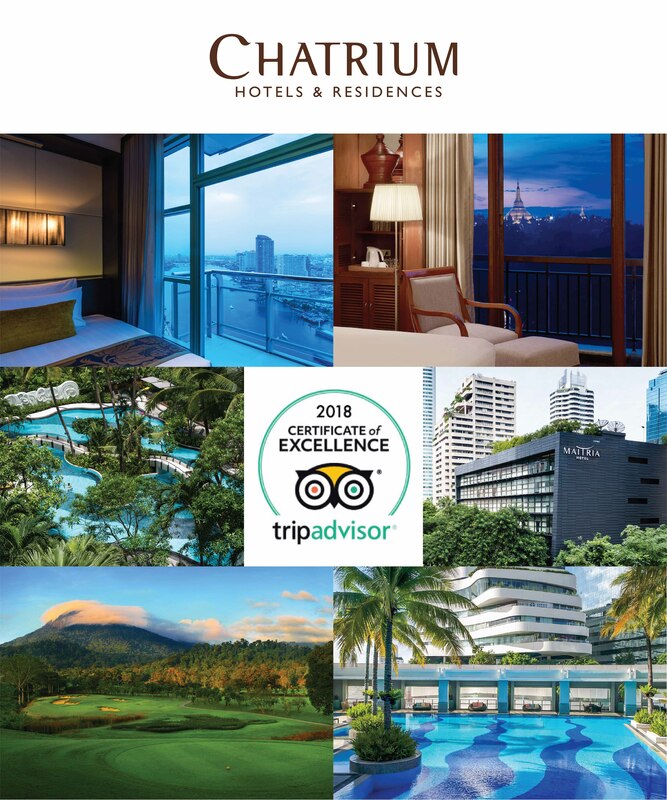 Chatrium offers guests seeking remarkable moments a well-crafted experience of comfort and luxury, along with authentic experiences in the globally renowned travel destinations of Thailand and Myanmar. The Chatrium family is truly honoured that the support of its guests has allowed its hotels and residences to receive this prestigious award. We greatly appreciate all the kind reviews that our guests have taken the time to submit, said Savitri Ramyarupa, Managing Director of Chatrium Hotels & Residences. “With this award, we will truly achieve our mission to help our guests Feel the Remarkable,” she said.